Christmas decorating and crafting. Two of my favorite things. In fact, around here I pretty much decorate for any holiday that we celebrate. It might actually be a part of my family’s DNA. My sister and I often compare notes about treasures we have found or ways we can save a buck while decorating our homes for our families. This past weekend I took a trip to the big ole city; a 2 ½ hour drive for me. Rural life problems, the struggle is real. But mama needed an afternoon away. And guess what? Dad survived. The kids survived. Mama sipped on her Starbucks while cruising the aisles of Target without distractions. It was glorious. Can you tell, I don’t get out very often? While there, I took care of errands and made a few stops to various shops on a mission to find inexpensive Christmas decorations and craft projects. I’ll be taking you along the ride as I show you how I made a few very easy Christmas crafts; all while keeping within my budget. I gave myself $25 to fulfill this task. First stop and probably the biggest success. The Dollar Tree. 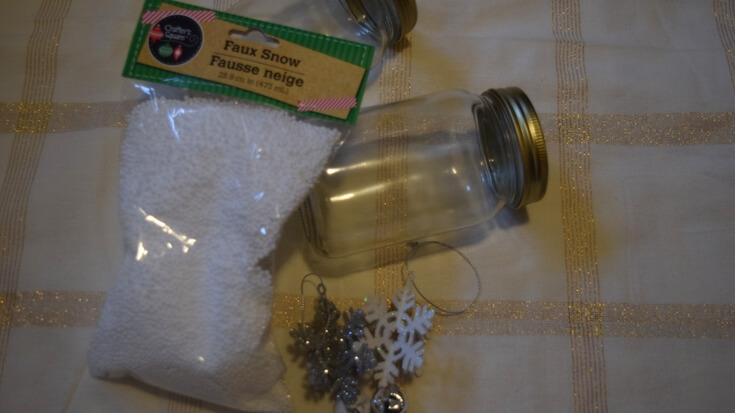 I picked up these “canning jars”, faux snow, 2 pack of snowflake ornaments – all for $4. A 12 pack of ornaments and floral foam for $3 total. 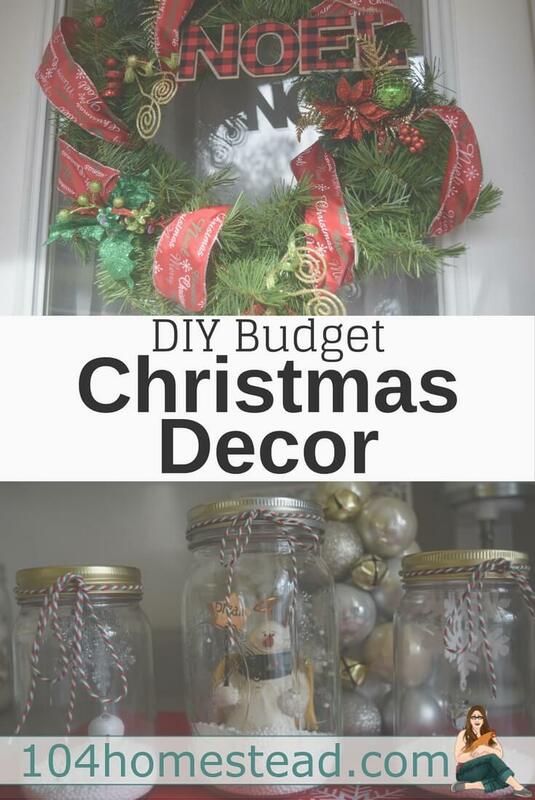 Using my hot glue gun, I glued the ornaments to the inside of the lids, then I added a little faux snow to the inside of the jars and Christmas colored twine which I already had to the lids. The snowman and larger mason jar, I already had on hand, but you could easily duplicate this by using a little ornament on the inside of the jar. Next I glued the ornaments around the outside of the floral foam and made an ornament tree (pictured behind the jars) and I added bells which I already had on hand to fill in the holes. Total cost for these two projects: $7! For this wreath, I found the ribbon, greenery, and floral picks at Dollar Tree for $7. This a wire wreath similar to the one that I used for only $3 at time of posting and the “Noel” sign is from Target for $3. Wreath total cost: $13! This wreath is really simple to make. First, use the greenery and wrap it around the wire wreath. I used floral wire to secure the greenery in place, you can use twisty ties or something similar if you don’t have floral wire on hand. No need to buy it just for this project. Unless you plan to make more crafts and goodies with it. Then, go for it. Next, I wrapped the ribbon around the wreath and secured it all in back with my hot glue gun. After that, I placed my floral picks in places that needed to be filled in and secured them with floral wire. These wreaths were also purchased at Dollar Tree for $1 each, the bows were $1 each and the ribbon was $1 for a roll. Total cost for two outdoor window wreaths: $5! Lastly, check out this super cute project that my sister put together from Target’s One Spot. These items are currently stocked in Target’s One Spot, but can easily be duplicated by heading to a nearby craft store, such as Hobby Lobby. The vintage style milk bottles were sold in a pack of two for $3, the red milk bottle crate was $5 and the cost of hot cocoa and marshmallows were a couple of dollars. So, this project could easily be duplicated for a little over $10! I have searched for similar items around the internet and they are quite expensive and could easily blow a budget if you need to stick with one. I found this chrome wire basket that would be another alternative and they have different sizes available at the time of posting. Another helpful tip – shop those after season clearance sales. I hit up Target every year after Christmas and stock up on things I’ll use such as Christmas cards, wrapping paper, bows, ribbons, lights, decorations. I give myself a budget and buy only the things that I really need. At 75-90% off it can easily get out of hand for me; confession from a rehabilitated shopaholic. That’s why keeping a budget and living frugally is important to me. Plus, there’s just so much satisfaction in creating something for such a great bargain. Who’s with me? Oh and in case you were wondering, this was not a sponsored post for Dollar Tree or Target; I just love them that much. They really do have cute pieces that can be transformed into adorable craft projects all while staying on a budget!